OLATHE, Kan.--(BUSINESS WIRE)--Garmin International Inc., a unit of Garmin Ltd. (NASDAQ: GRMN), today announced the aera 660, a new cost-effective, feature-rich, purpose-built aviation portable. The compact 5-inch capacitive touchscreen boasts a bright, sunlight readable display complete with rich, interactive maps and a built-in GPS/GLONASS receiver that can be viewed in portrait or landscape modes for optimum customization. The aera 660 encompasses many of the features of the renowned aera® and GPSMAP® aviation portable series, adding new Connext™ wireless capabilities, WireAware™ wire-strike avoidance technology and more. New cost-effective database options along with built-in Wi-Fi® database updating capabilities allow customers to more easily access the most up-to-date data, including daily U.S. fuel prices. Bluetooth® supports the display of ADS-B In traffic and weather1 from a variety of sources, including the GDL® 39/GDL 39 3D, Flight Stream and the GTX 345 ADS-B transponder. Availability of the aera 660 is expected later this month at an anticipated street price of $8492. The aera 660 features a 5-inch capacitive touchscreen display that has been optimized for cockpits and various types of flying. An elegant, yet rugged design allows the aera 660 to withstand the harshest environments, meeting stringent temperature tests and helicopter vibration standards. Garmin’s signature direct-to feature is always available so it’s easy to command navigation functions or find nearest airports from any page. A mini-USB connector and micro SD card slot accompany a dedicated power button along the bezel of the aera. Depending on settings and external connections, pilots can receive up to four hours of battery life on a single charge. An intuitive user-interface resembles that of the popular GTN™ 650/750 touchscreen series, G3X™ Touch and aera 795/796 portable series, so pilots can easily transition between the aera 660 and other Garmin products in the cockpit. The 3D Vision page within the aera 660 leverages a worldwide terrain database to create a rich, 3D representation of rising terrain near the aircraft, while overlaying GPS-derived airspeed, altitude and vertical speed alongside flight plan information. 3D Vision also displays lateral and vertical (VNAV) deviation bars and includes a 360-degree HSI, which displays course deviation, track, bearing and more. Bearing pointers can be manually configured to identify the nearest airport, complete with distance information. When connected to the GTX 345, GDL 39 3D or Flight Stream, the 3D Vision presentation is further enhanced with the display of pitch, roll and slip-skid information. A pilot-selectable presentation optionally displays flight instruments in round gauges or tapes overlaid on the 3D topographic landscape. Wireless connectivity options set the aera 660 even further apart from other portables on the market. Wireless database updating capabilities add to the unique feature set of the aera 660. When connected to Wi-Fi, pilots can easily download and update aviation databases without the need to physically connect the aera to a computer. Additionally, the aera 660 also supports connectivity with VIRB® XE, Garmin’s HD action camera so pilots can control video recording and take photos. When paired with the GTX 345, Flight Stream or the GDL 39/GDL 39 3D, ADS-B traffic and weather is wirelessly transferred and displayed on the aera 660. ADS-B traffic information may be viewed on the moving map, chart and dedicated traffic pages, which also leverages patent-pending features such as TargetTrend™ and TerminalTraffic™. Traffic trajectories and potential conflicts are easier to identify with TargetTrend, which incorporates relative motion technology to help pilots visualize the future position of nearby traffic targets relative to the aircraft. The traffic picture is enhanced during taxi, takeoff and landing with TerminalTraffic, which detects and displays other aircraft or ground vehicles on runways or taxiways who are also broadcasting ADS-B position information. SafeTaxi® geo-referenced airport diagrams also aid in situational awareness by identifying runways, taxiways, FBO’s, hangars and more relative to the aircraft’s position on the airport surface. Subscription-free Flight Information Service-Broadcast (FIS-B) weather products may simultaneously be overlaid on the map page and dedicated weather pages for easy interpretation. Weather-related decision-making is easier with the aera 660, which animates NEXRAD radar imagery. Additionally, multiple weather products can be overlaid on a single weather page for better analysis. Comprehensive chart options provide pilots with an easy path to a paperless cockpit in a compact device, which may be qualified for use as either a Class I or Class II Electronic Flight Bag (EFB). Geo-referenced IFR enroute, VFR sectional charts and Garmin FliteCharts® terminal procedures are available as part of the expansive database offerings associated with the aera 660. Using FliteCharts, pilots can easily view departure procedures (DPs), standard terminal arrival routes (STARs) and geo-referenced approach charts. Additionally, Garmin ChartView™ enables the display of Jeppesen charts with an optional subscription from Jeppesen. Fuel price data is easily accessible on the map or within the airport directory database, so it’s easy to identify the lowest price of 100 LL and Jet A in the area. Similar to features found within other Garmin products, patented Smart Airspace™ accompanies the aera 660 feature set. Smart Airspace highlights the airspace nearest the aircraft’s current altitude and de-emphasizes non-pertinent airspace so pilots can quickly identify their location relative to the airspace around them. For pilots in Europe, the Atlantic version of the aera 660 includes the new Enhanced Basemap, which provides VFR operators with more visual landmarks and intersections that are often used when contacting air traffic control. Additionally, when selecting a street or intersection on the moving map of the aera, street names populate so it’s easier to identify aircraft location. The aera 660 contains built-in features tailored to helicopter operators, including WireAware wire-strike avoidance technology. WireAware overlays power line locations and relative altitude information on the moving map and provides both aural and visual alerting when operating near power lines. Altitude display is offered in both mean sea level (MSL) and above ground level (AGL), so they are easier to identify relative to the aircraft flight path. The standard obstacle database contains Hazardous Obstacle Transmission (HOT) lines, which typically include those that span rivers, canyons, valleys or those that are within the vicinity of airports. Obstacle databases with comprehensive power line coverage and HOT lines are also available for the U.S. and portions of Canada and Mexico. Additionally, VFR helicopter chart coverage throughout eight major metropolitan areas within the U.S. depict helicopter airways and routes, heliports with associated frequency and lighting capabilities, NAVAID information and obstructions. Coverage for the Gulf of Mexico is also available, which includes offshore oil drilling platforms and more. Operators may also incorporate City Navigator® NT street maps to enable address look-up functions within the aera to easily navigate to street intersections during off-airport operations. Pilots can connect an optional bare wire quick-release mount to the aircraft instrument panel and utilize the aera 660’s power, audio and dual RS-232 connections. When paired with a navigator such as the GTN 650/750 touchscreen series or the GNS 430W/530W, the aera can receive flight plan data entered into the navigator over a serial port and remain synchronized throughout the flight. When connected to a NAV/COM such as the GTR 225, GNC 255, GTR 200, SL 30 or SL 40 frequencies and airport identifiers can also be transferred from the aera to the corresponding NAV/COM. When connected to the GTX 345, GDL 39 or GDL 39 3D, ADS-B traffic and weather can be transferred via the wired connection to the aera 660. The new Garmin Navigation Database available for North America offers a cost-effective path to incorporate the latest database information into the aera 660. Navigation data includes the option to load and activate instrument approach procedures, load flight plan data and more. The new Garmin Navigation Database starts at $29.95 for a single update. A variety of cost-effective annual bundles are also available such as the U.S. bundle for $149.95, which includes the Garmin Navigation Database, FliteCharts, IFR/VFR Charts, Terrain, Obstacles, SafeTaxi and the AOPA Airport Directory with fuel prices. For worldwide coverage, Jeppesen NavData is also available for purchase. Once purchased via flyGarmin.com, these databases can be conveniently downloaded and updated on the aera 660 via Wi-Fi. The aera 660 is expected to be available later this month at an anticipated street price of $8492. For additional information, visit: www.garmin.com/aviation. Garmin International Inc. is a subsidiary of Garmin Ltd. (Nasdaq: GRMN). Garmin Ltd. is incorporated in Switzerland, and its principal subsidiaries are located in the United States, Taiwan and the United Kingdom. Garmin, aera, Bluetooth, City Navigator, FliteCharts, Safe Taxi and aera are registered trademarks and Connext, GTN, TargetTrend, TerminalTraffic, ChartView, Smart Airspace and G3X are trademarks of Garmin Ltd. or its subsidiaries. 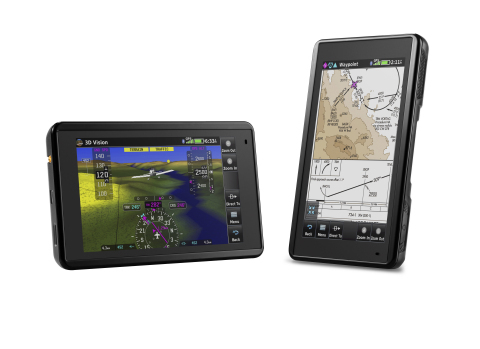 Garmin International today announced the aera 660, a new cost-effective, feature-rich, purpose-built aviation portable.